The findings represent a troublesome counterpunch to an overall decline in deforestation rates in the region and indicate high-value timber species such as ipê may be at risk of overexploitation. At 2.1 million square miles, the Amazon Rainforest is the world's largest intact forest, with the majority of it in Brazil. The Amazon Basin is home to 10 percent of all known plant and animal species and stores 100 billion metric tons of carbon—greater than 10 times the amount emitted each year from the use of fossil fuels. Over the last four decades, more than 18 percent of the Brazilian Amazon—picture an area roughly the size of California—has been lost to illegal logging, soy plantations and cattle ranches, though at a decelerating pace; the rate of deforestation went down 76 percent from 2004 to 2017. "If a company receives permits to extract and transport more timber than exists on the property covered by the permits, wood harvested illegally from other areas can be sold as if it came from the permitted property," said study co-author Mark Schulze, faculty member in OSU's College of Forestry and director of the H.J. Andrews Experimental Forest. Schulze, corresponding author Pedro Brancalion of the University of Sao Paulo and Brazilian colleagues analyzed discrepancies between estimated timber volumes in a national forest inventory and volumes of logging permits. They found a strong and deliberate "overestimation bias" of high-value species—that means there weren't as many of those trees as had been estimated, or they weren't as large, opening the door for those permits to become attached to trees harvested illegally from other locations. "Illegal logging is a huge barrier for using timber markets to promote sustainable use and conservation of forests," Schulze said, noting that almost half of the harvest in 2015 and 2016 in the Brazilian Amazon's top timber-production area was illegal. The analysis found a relatively small subset of those in charge of logging permits was responsible for the pattern of egregiously overestimating the volume of high-value trees—at rates that would suggest corruption as opposed to simple identification mistakes. "Field assessments of some of the most implausible timber inventories confirmed they did overestimate actual volumes of high-value timber species like ipê," Schulze said. "We found 13 commercial species 'erroneously' identified as ipê, with low-value tanimbuca, jarana and timborana being the most frequent." Most of the non-ipê trees were of species not included in the logging permit—not considered valuable enough to harvest—which means they wouldn't be harvested and the extra ipê volume picked up through "misidentification" could be easily used as cover for illegal ipês. "Until timber inventories submitted to Brazilian regulatory agencies are scrutinized for plausibility and substantial resources are dedicated to field audits, this form of fraud will not be detected," Schulze said. Ipê species, he noted, are easy to identify and distinguish from jarana, tanimbuca and timborana. The diameter of the real ipê trees was also frequently exaggerated. 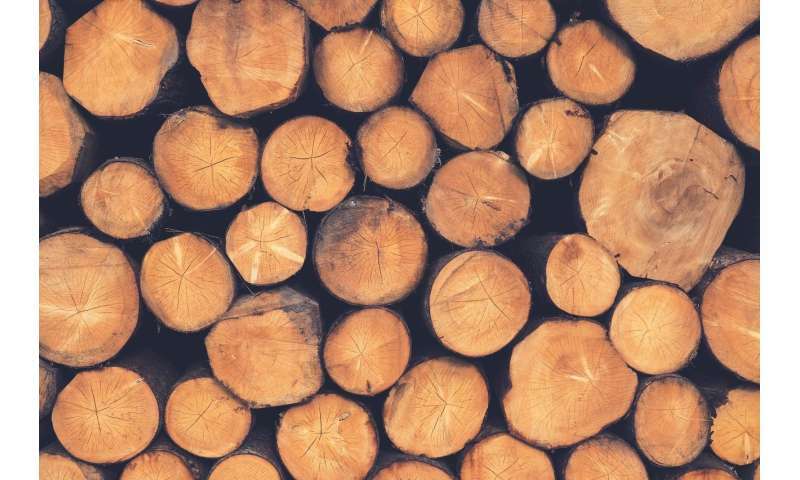 "Only companies wishing to generate a surplus of permitted timber volume would benefit from producing inaccurate forest inventory data," Schulze said. "Inaccuracies could also result from rushed or incompetent field work, but such mistakes would be expected to produce both underestimates and overestimates of timber volume. Consistent overestimates of the stocks of the highest-value timber species are unlikely to result from random errors." "Well-regulated forest management in the Amazon can contribute to local livelihoods and conservation goals, but without effective enforcement of existing laws and regulations illegal logging will continue to lead directly to forest degradation and indirectly to deforestation," Schulze said. "If consumers of tropical hardwoods are concerned about inadvertently supporting illegal harvests, they can look for third-party certification labels that ensure the wood was harvested legally and did not mix with wood of unknown origin en route from the forest to the lumberyard."